Meatballs! You can never go wrong serving meatballs. Whether it’s for an appetizer, a hot sandwich, atop a pizza, with lingonberry jam (I can go on and on), it is rarely served with creamy, dreamy, buttery mashed potatoes…and why not?? *If you’d like, and have the time, sauté the onions on low with a couple of tablespoons of butter and a pinch of salt until caramelized. Add these to the slow cooker, along with the other ingredients, in the beginning versus raw. Either way, it’s delicious! Spray your slow cooker with non-stick spray. Layer in half of the onions and mushrooms, followed by the frozen meatballs and then the remaining onions and mushrooms. In a large bowl, whisk together the cream of mushroom soup, dried onion soup mix, milk and pepper. Pour overtop the meatballs. Set to low for 6 hours, stirring once or twice. 30 minutes prior to eating, layer the swiss cheese overtop. Recover and allow to melt. Serve in a bowl with buttery mashed potatoes or wide egg noodles and a sprinkle of parsley, enjoy! When a Turkey and Swiss just won’t cut it…I give you THIS! Now, like most sane adults, I’m a sucker for a meatball sub, hoagie, grinder..whatever. They’re gooood no matter what you call your sandwich! The last time I played around with the ever popular recipe, I tweaked it with a cheddar and barbeque flair (try that one too please….ughhh sooo good). However, THIS TIME, I’m giving it that TexMex flavor and turning the great state of Texas’ favorite enchilada into a handheld vessel. Genius you say? Yes. Yes it is. Now, you do not have to use the enchilada flavored meatballs to make only a sub sandwich. By all means, use them on their own with a plate of rice, refried beans, warm tortillas or chips…wrap them in a large flour tortilla with extra enchilada sauce and beans or place them on a platter alongside toothpicks for a great appetizer! No disappointment will follow. * I used Oaxaca Cheese for my meatballs (Mexico’s version of mozzarella), but feel free to use any of your favorite melty cheese! I.e. Monterey Jack, mozzarella, cheddar blend, Pepper Jack, etc. Preheat the oven to 350 degrees and lightly grease a 9×13 casserole dish. 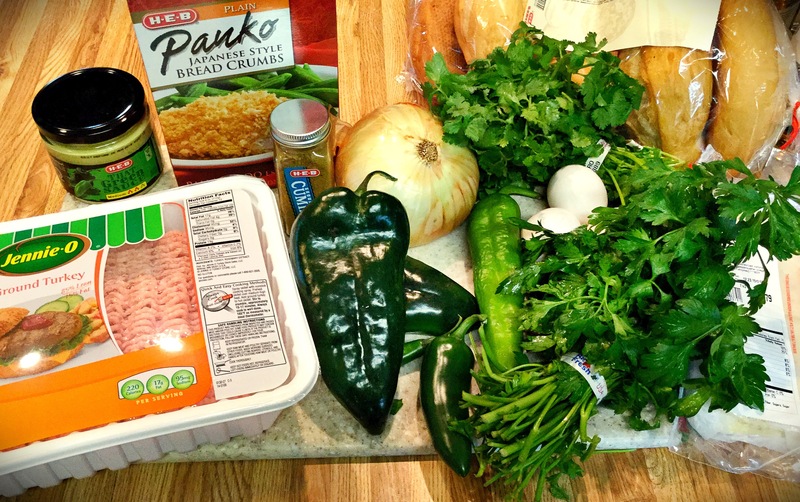 In a large bowl, combine the ground beef, 1/4 cup of the enchilada sauce, panko, eggs, jalapeno, onion, garlic, cilantro and spices until just incorporated. I just use my good ol’ hands for this and no need to overwork. Using an ice cream scooper or again, your hands as I did, make about 2″ balls and place into the 9×13 dish. *Try to make them relatively the same size for even cooking. 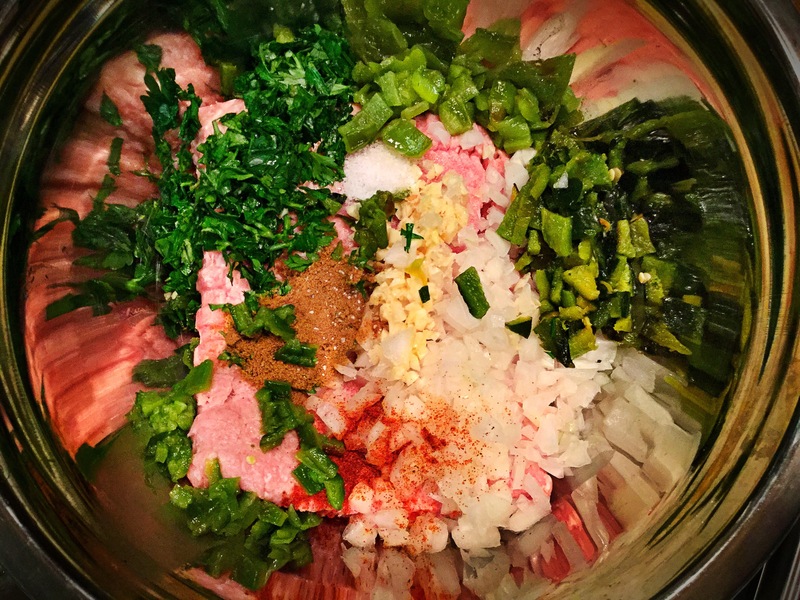 You can always add/take away the meat mixture to make even. Pour the remaining enchilada sauce overtop all of the meatballs and cover with foil. Bake in your 350 degree oven for 30-35 minutes. Uncover and add the cheese overtop, bake uncovered for 10-15 minutes more. Serve warm straight from pan with a side of rice, beans and tortillas OR turn into a monster sub sandwich with Mexican inspired toppings of your choice! Enjoy! MMmmm….meatballs! Yes, for those of y’all that are not “in the know”, meatballs translated in Spanish is: albondigas. The more you know. 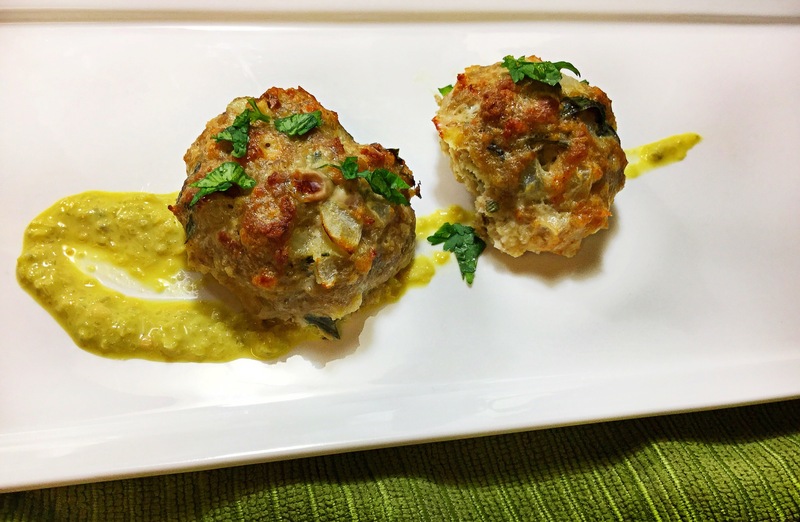 These said albondigas just so happen to pair beautifully with green chiles and creamy alfredo sauce…they almost cancel each other out to flow beautifully together. Not too spicy, not too bland. I like to serve ours with a bit more cheese and chopped roasted peppers, but however you do it, you’ve made yourself a more elegant, Mexican-inspired meal. Move over Taco Tuesday! *You can make your own albondigas (your typical meatball recipe but combined with more Mexican spices: cumin, salsa, carrots, cilantro, Mexican oregano, etc) or you can use a bag of frozen Italian meatballs, both delicious. *If gets too thick/not to the creaminess you prefer, you can add a splash of milk or heavy cream. Kosher salt & pepper, to taste. 1. Begin by heating a 10″-12″ pan to medium high heat. (I actually love my cast iron for this, a bit of scraping is needed, but it creates almost a ‘crust’ on the noodles. Though a non-stick would leave you an equally delightful super creamy version). 2. To that hot pan, pour in the oil and followed by the meatballs to sear all over, 5-10 minutes. (I used straight from frozen/fully cooked and work just fine!). 3. To the seared meatballs, add the onions and sauté for 5 minutes. 4. Once the onions are just translucent in color, whisk in the cubed cream cheese and can of soup. Whisk, whisk, whisk! 5. Next pour in the water/or broth, your 8oz of noodles and can of hot green chiles with juices. Bring to a quick boil, stir. Cover and allow to simmer over medium heat for 15-20 minutes. 6. Finally, uncover, and toss in the halved cherry tomatoes and parmesan cheese. Taste for salt and pepper. Simmer on low, uncovered, for 5 more minutes. Serve: either individually or family style, top with a bit more parmesan, roasted peppers and chopped flat-leaf parsley. Enjoy! Here is an insanely flavorful and healthy recipe that will give the normal hum-drum appetizer or hot meatball sandwich a run for its money! That’s right..these baked turkey meatballs can be used in a multitude of ways (a spin on the traditional albondigas soup anyone??)! Plus, they are NOT dry or crumbling once browned and ready to eat. It is really such a yummy alternative to the classic recipe. 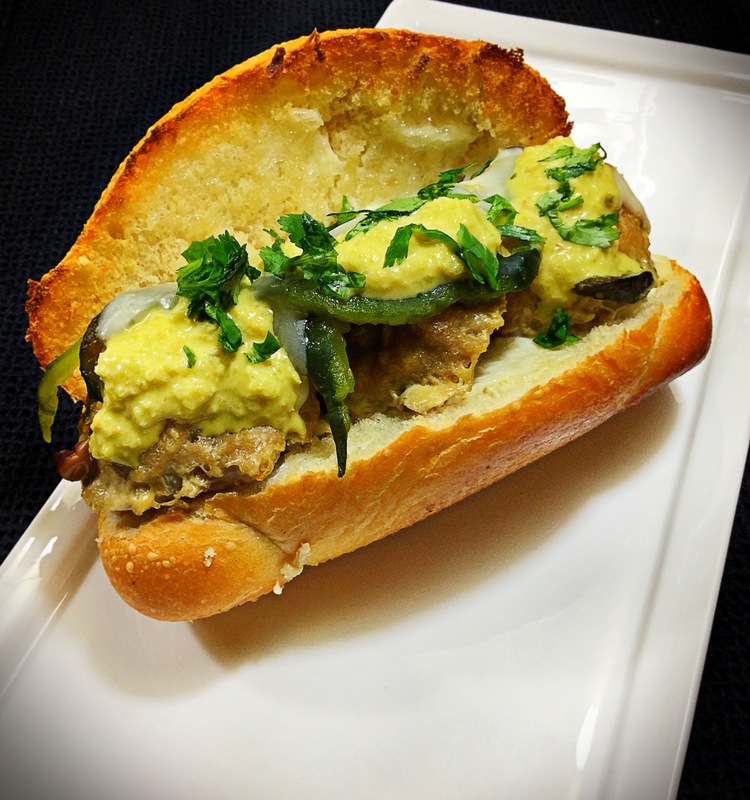 Today though, I show you the above mentioned, a fun holiday appetizer and a filling hot hoagie sandwich! …and BOTH don’t hurt your waistline too bad either 😉 Win!! *For all my fellow ‘railroad wives’, prepare the sandwich as instructed below. Wrap in foil and your spouse can heat them up on the trains engine as my hubby does! We’ll start this bursting with flavor recipe by placing our 4-5 chilé peppers onto a foil lined baking sheet, then pop it into the oven on broil (just inches under broiler). Make sure to turn the peppers ever so often to blacken all of the sides. You can also do this over an open flame (gas stove or grill). Once blackened immediately place into a large bowl covered with Saran Wrap and set aside to steam. 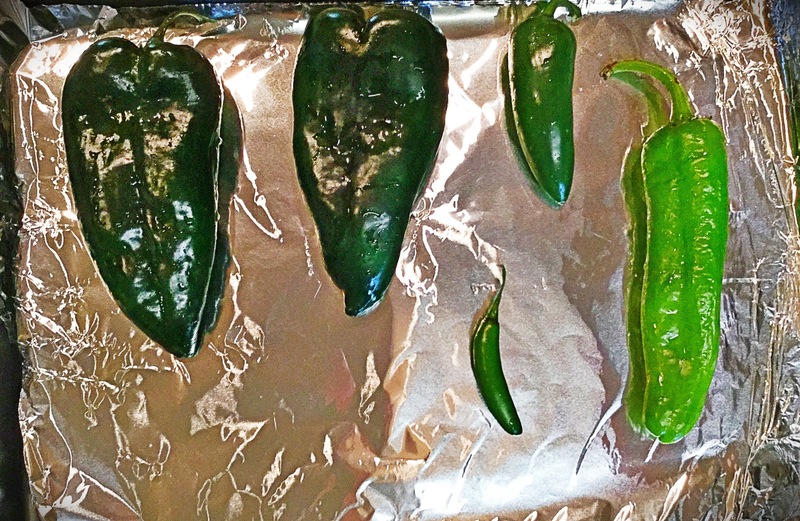 After about 10-15 minutes, the peppers skins will loosen up and peel off the peppers easily. Then slice open each pepper and scrape out the seeds and chop up. 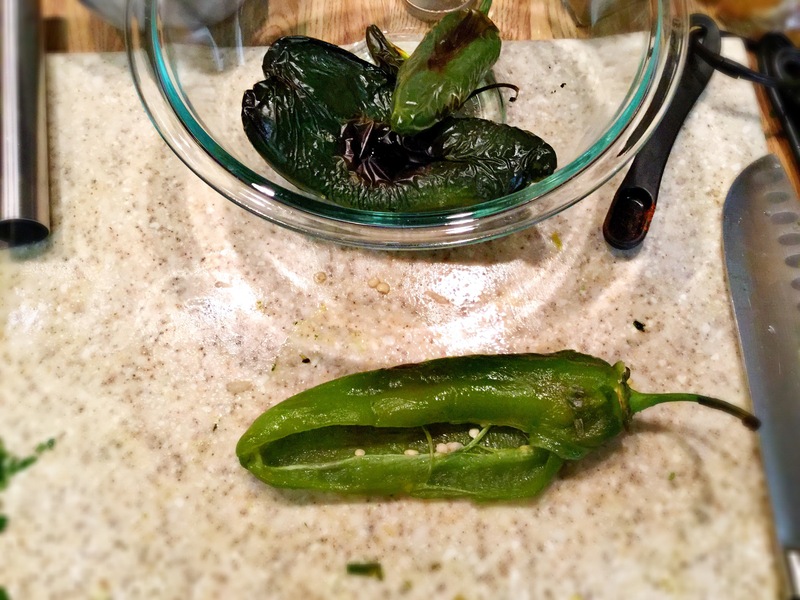 *if making the hoagie, then reserve one of the roasted poblanos and cut into long strips after scraping out seeds and removing the blackened skin. Set aside. Preheat oven to 375 degrees and line two large baking sheets with foil. In a small bowl, combine the panko and the milk, allow to soak together. In a large bowl, combine the ground turkey, the 4 roasted and chopped peppers, onion, garlic, parsely, 1/2 of the cilantro and the spices, followed by the eggs and the panko-milk mixture. With you hands (natures best tools! 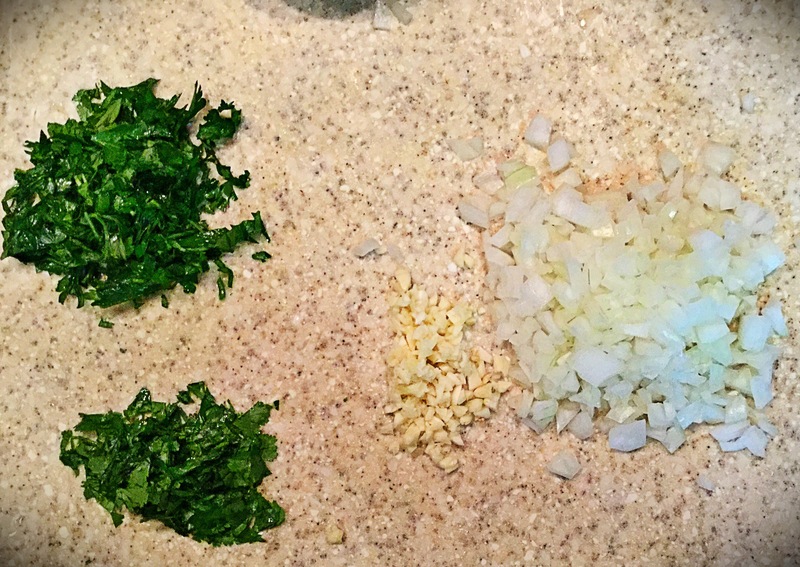 ), mix together until all of the ingredients are evenly distributed. 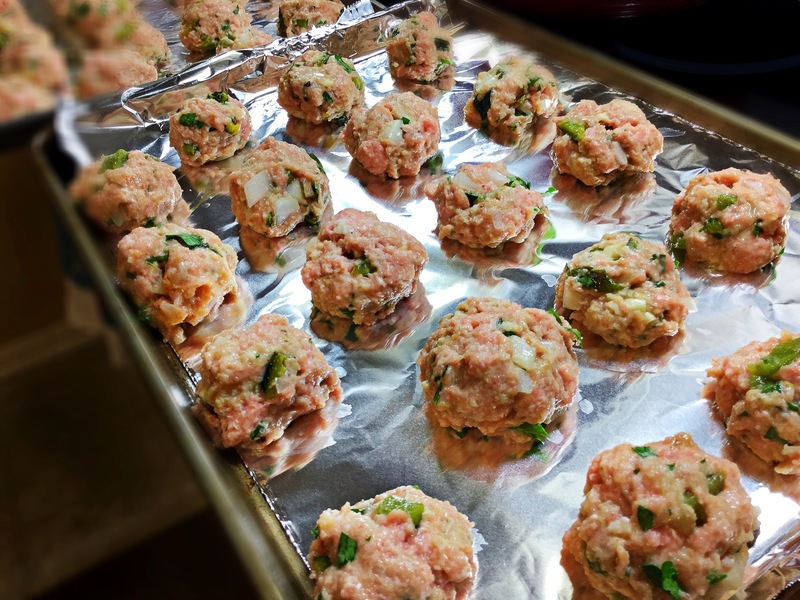 Now, again, with your hands or an ice scream scoop, make the turkey meatballs (about large golf ball size) and place onto the prepared baking sheets. Once you have them all finished, place the sheets into the oven for 40-60 minutes, until no longer pink in the middle and nicely browned on the outside. *depending, you may have to alternate racks once or twice during baking for even cooking. NOW…if you’re making these for an appetizer, then place on a pretty platter alongside a spicy green sauce for dipping and garnish with the remaining chopped cilantro overtop. Gorgeous and fun!! OR….if you’re making a meal out of these flavorful meatballs then try this on for size!! Slice your hoagie rolls in half and apply 1 Tbsp of mayonaisse to each side. On the bottom slice, lay down a few meatballs and a nice slice of pepper jack cheese and put this into your oven (on broil) for just a couple minutes (until bread is toasted/cheese melted). Remove from oven and garnish with the reserved chopped cilantro, roasted & sliced poblanos and a drizzle of your spicy green sauce! Soooo gooooddd!!! !